Thoughts and Actions: Let them spring from love | "Where in the world are Barry and Renee?" in Activism, Maui, Peace, Politics, Religion, U.S.
On Saturday, January 13, my husband Barry, our friend Gail from Washington State, and I lounged on our lanai on the warm Maui morning. We watched the birds congregate at our feeder: lots of little red beaked Java sparrows, vibrantly colored love birds, red-headed finches, and an occasional Hawaiian cardinal. 1) Where could we take shelter? We live in a house of single-wall construction, with lots of windows, set on posts and pilings attached to volcanic rock. We don’t even have basements in Hawaii let alone bomb shelters. For a short while during the 1960s when everyone in the U.S. was afraid the Russians would attack, my dad – as a part-time job – sold home bomb shelters that could be built in your backyard. But that was in the Midwest and a long time ago. (I don’t think Dad sold many, and we certainly couldn’t afford one). At school, we practiced crouching under our desks as a way to be protected from atomic bombs!! Ridiculous! 2) I’ve read Japanese author Masuji Ibuse’s Black Rain, a dispassionate but memorable novel based on historical records of the devastation caused by the atomic bombing of Hiroshima and those who survived. I’ve been to Hiroshima and the Peace Museum there where photos show that people were vaporized by bombs much smaller than the ones available today. 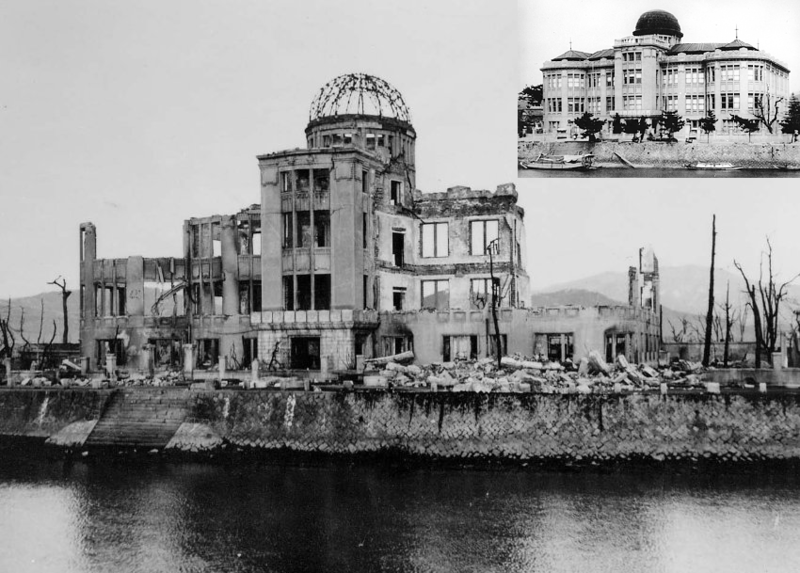 Photos of the Prefectural Industrial Promotion Building before (inset) and after the bombing of Hiroshima – now known as the Peace Dome, the Atomic Bomb Dome, or A-Bomb Dome (原爆ドーム Genbaku Dōmu)). It is part of the Hiroshima Peace Memorial Park in Hiroshima, Japan and a UNESCO World Heritage. In Hiroshima, 30 days after the 1st atomic bomb destroyed the city and shook the world, people are still dying, mysteriously and horribly — people who were uninjured in the cataclysm from an unknown something which I can only describe as the atomic plague. Hiroshima does not look like a bombed city. It looks as if a monster steamroller has passed over it and squashed it out of existence. I write these facts as dispassionately as I can in the hope that they will act as a warning to the world. When you arrive in Hiroshima you can look around for twenty-five and perhaps thirty square miles and you can see hardly a building. It gives you an empty feeling in the stomach to see such man-made destruction. I picked my way to a shack used as a temporary police headquarters in the middle of the vanished city. Looking south from there I could see about three miles of reddish rubble. That is all the atomic bomb left of dozens of blocks of city streets, of buildings, homes, factories and human beings. There is just nothing standing except about twenty factory chimneys — chimneys with no factories. A group of half a dozen gutted buildings. And then again, nothing. The police chief of Hiroshima welcomed me eagerly as the first Allied correspondent to reach the city. With the local manager of Domei, the leading Japanese news agency, he drove me through, or perhaps I should say over, the city. And he took me to hospitals where the victims of the bomb are still being treated. In these hospitals I found people who, when the bomb fell suffered absolutely no injuries, but now are dying from the uncanny after-effects. For no apparent reason their health began to fail. They lost appetite. Their hair fell out. Bluish spots appeared on their bodies. And then bleeding began from the ears, nose, and mouth. At first, the doctors told me, they thought these were the symptoms of general debility. They gave their patients Vitamin A injections. The results were horrible. The flesh started rotting away from the hole caused by the injection of the needle. And in every case the victim died. That is one of the after-effects of the first atomic bomb man ever dropped and I do not want to see any more examples of it. . . .
Go to the above link for the rest of the article. “With so much at stake, it’s important to understand what these things are capable of. Go to the above link to see a video about how big and numerous our nuclear weapons are. Also, for those surviving the initial bombing, the radiation sickness caused agonizing deaths. (Also, the birth defects that follow the family of the survivors reach into subsequent generations). 3) I would not want to survive an atomic blast. 4) Even if I did somehow survive the blast, there would be huge problems in Hawaii. Although the Hawaiians were self-sustaining for thousands of years, now “modern” Hawaii imports 90-95% of its food and energy. We are one of the most food vulnerable places on Earth. If there were a catastrophe, we would soon be out of food and fuel. Puerto Rico is still not getting needed help from the devastation caused by Hurricane Maria on September 20, 2017. Holms reports, It’s been “three months since Hurricane Maria made landfall in Puerto Rico, unleashing the full force of a Category 4 storm on the American territory. The intensity of the 155 mile-per-hour winds and the ferocity of the rainfall led the island’s residents to believe they had encountered something not of this world. . .
Puerto Rico is much closer to the Mainland U.S. than we are; we aren’t likely to get much help from our current administration. 5) Where was President Trump – and what was he doing with his “bigger button”? Such terrifying thoughts raced through my mind as I ran back outside to alert Barry and Gail. Gail, being the smart Microsoft contractor that she is, immediately opened her computer and checked The New York Times. Lead stories included one on the U.S. economy and one on gay rights. There was nothing about missiles headed toward Hawaii. Barry, the always great researcher, ran to the kitchen and turned on the radio. There was nothing on any channel. There were no continuing disaster sirens. We decided the alert had been a hoax or a hack. Besides, we were with people we loved, watching birds, and drinking coffee. Our neighbor came up with his cup of coffee. Our other lovely neighbor was off paddling in the ocean. Our son and his little family were on the U.S. Mainland. If we were to go, it would be quick – and besides the crisis didn’t seem real. Another alarm signal came 38 minutes later saying the first had been a mistake. Later we learned that our president had been playing golf in Florida, so he didn’t overreact to the “news.” The whole situation reminded us that we must check our sources, but it also reminded us that we haven’t really worried about nuclear threats since the early 60s. At home on our lanai, our little gathering did have a heightened sense of appreciation for the beautiful day, our relationships, our lives, and we poured another round of coffee. Stop the Nuclear Attack Warning System; it deceives people into believing there is something they can do to protect themselves. There isn’t. As an interviewer and researcher who lived in Hiroshima for over 10 years, I learned that any survival is a fluke. The small bombs that were detonated in Japan vaporized people in an instant, leaving only their shadows. Skin melted off, neighborhoods disappeared, people who were in shelters were sucked out by an intense force and those who survived for a while died horrific deaths from radiation poisoning. The warning signal is a cruel lie. Nuclear war is neither acceptable nor inevitable. Did you know that in 1929 a law was passed making war illegal? It’s called the Kellogg Brian Pact. It was put forth by our secretary of state, Frank B. Kellogg, and his French counterpart, Aristide Briand. Did you also know that Hawaii is the first state to recognize the KBP law thanks to Mayor Alan Arakawa’s signing a proclamation making Aug. 27 KBP day? And that Gov. David Ige recognized KBP in a Peace Day proclamation at the Nisei Veterans Memorial Center in September? Instead of sirens we need to find a way to de-escalate the path toward nuclear war. Could it be through legal action such as fines for incitement since KBP outlaws war? Surely, we can all work for peace and toward peace. Gandhi said, “The real love is to love them that hate you, to love your neighbor even though you distrust him. Non-violence requires a double faith, faith in God and also faith in man. I object to violence because when it appears to do good, the good is only temporary; the evil it does is permanent. . . .
Let’s put our focus and energy on understanding and loving everyone. Our survival and that of the Earth depends on it. I agree..and honestly?, it seems Puerto Rico is on quite a dubious position, not an US state nor an independent country, WTF? dat’s y they don’t receive proper needed help, seen as US backyard and US government has serious stuff to do inside its own territory and don’t help Puerto Rico properly, sadly..also, I feel glad my Brasil is down south Caribbean and far from hurricane threat zone ❤️ but we’re getting a hurricane of Venezuelan refugees, due to crisis in their country. Brasil is in bad crisis too, but NOT as horrible as Venezuelan one. my fam has helped some Venezuelan indigenous thro giving them basic stuff we don’t use anymore, as we don’t have money for donate nor can help them with job finding, those stuff…our governments should, instead. oh!, if corruption was minimal in Brasil.. so, we need to help those in need and identify when they’re in need so we can help them properly according to their needs. BTW, I’m not much of a Christian, but I’m sure Jesus would be devasted if he knew wha’ we do with our Planet Earth and its beings – including ourselves -, so we need to change our attitudes. also, u has Instagram? I’m sure Jesus wouldn’t like it, and, BTW, da Islamic and Buddhist quotes u put there r really wonderful – all religions wanna teach us da same: love -, but it seems we’re too self-centered, therefore, unable to love in great scale, as dogs and cats do. also, I don’t have Facebook, sorry, just an arts acc on Instagram – I’m furry artist -, and wanna add u if u installs it. have yuh been to Thailand? or just Bali? if yah, would u recommend gonna Thailand and Bali in December-January?